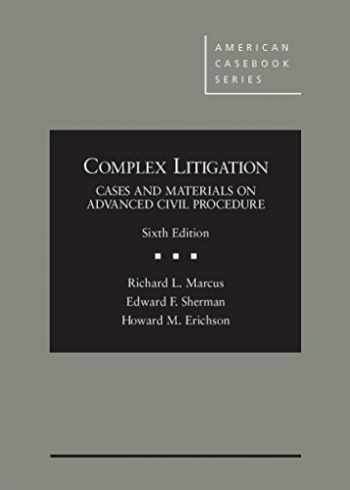 Acknowledged author Richard Marcus wrote Complex Litigation: Cases and Materials on Advanced Civil Procedure (American Casebook Series) comprising 900 pages back in 2015. Textbook and etextbook are published under ISBN 1628101423 and 9781628101423. Since then Complex Litigation: Cases and Materials on Advanced Civil Procedure (American Casebook Series) textbook was available to sell back to BooksRun online for the top buyback price of $52.05 or rent at the marketplace. For 30 years, this casebook has been the staple of Complex Litigation courses. It covers a wide variety of cases – civil rights, mass torts, securities, consumer rights – and provides a strong foundation for classroom coverage regarding any type of complex litigation. The current edition retains the book's familiar broad coverage while adding coverage of important recent developments. The class action chapter includes the recent Supreme Court class-action decisions. The first chapter has been revised to provide more consideration of the role of complex litigation in private enforcement of public norms. The book's treatment of multidistrict litigation has grown substantially in recognition of its increasing prominence, including a new section on the BP Oil Spill litigation. The treatment of electronic discovery takes account of ongoing changes in practice and further revisions expected in the Federal Rules.